Today’s podcast is about how to become the “bad boy” (or gal) in your industry. The world has enough nice guys and nice girls. The world needs men and women with… an EDGE. …men and women who believe in something. …men and women who stand for something. …men and women who inject everything they do with their unique, powerful and beautiful identity (opinions of the masses be damned). How to cut through the garbage, get to who you really are and use your REAL identity to crush the competition, attract customers and clients you love and be the change you want to see in the world. Just how the hell do you do that? 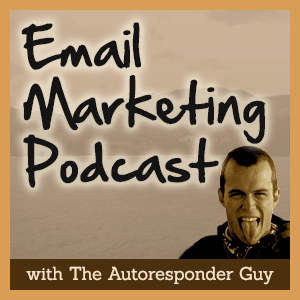 Listen to episode 23 of the Email Marketing Podcast to find out. Matthew Goldfarb is the “head honcho” or “Chief Renegade Officer” at Corporate Renegade, a creative agency that creates breakthrough copy, messaging and strategy, with a simple end goal in mind… help people stand out. Matthew’s goal with Corporate Renegade is to help people stand out, get noticed and ultimately, get paid. He worked as a writer in the advertising industry for 12 years before setting off to blaze his own trail. how do household brands like Starbucks build MASSIVE businesses and do it relatively easily?